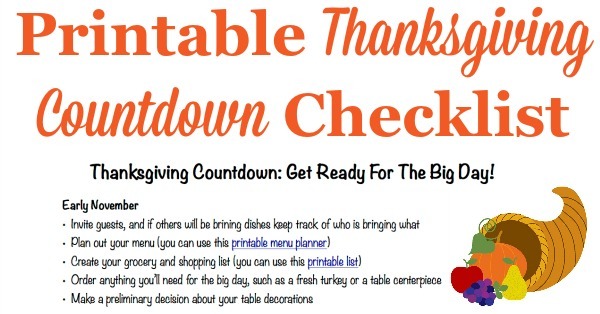 Getting ready for a big holiday celebration, like Thanksgiving, can feel overwhelming, but it doesn't have to. 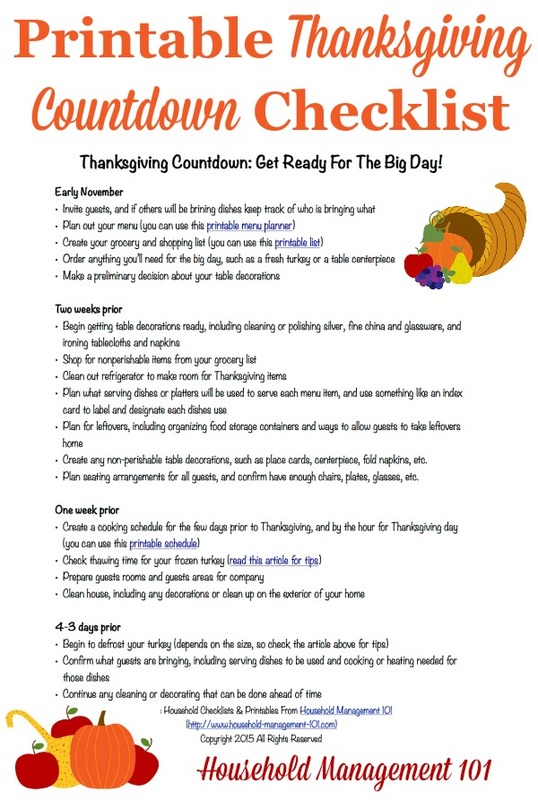 Use this Thanksgiving countdown plan, which lists all of the major things you need to do to get ready for the big day, to help you. 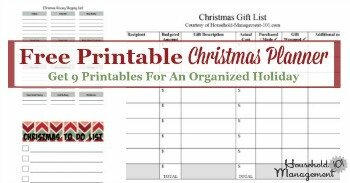 I've even included a free printable checklist or schedule of tasks you can reference! 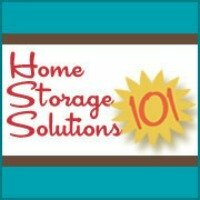 If you've been following along with the Stress Free Holidays Challenge we do here on the site each year you've already been told, week by week, to do these things. But I felt like seeing it all together could help you see the big picture, so I've listed all the steps here! 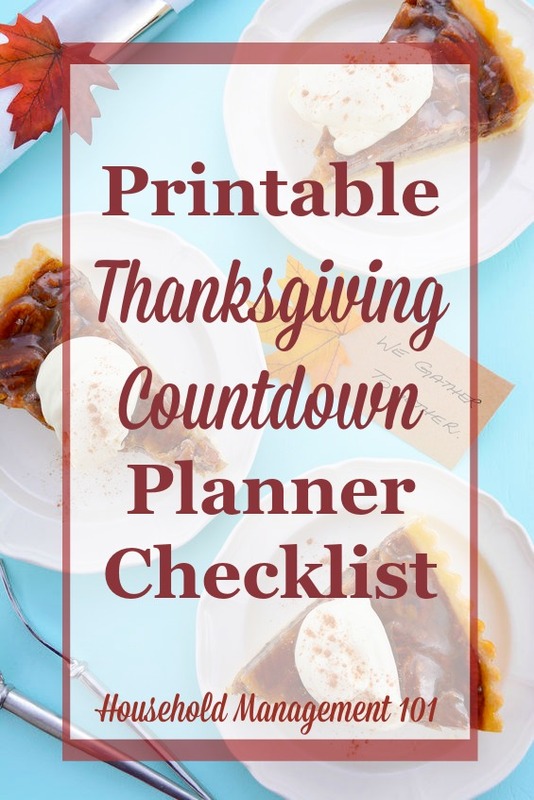 Make sure to follow the links throughout the countdown list as well, to get additional resources, including more detailed instructions and also some additional printables I've created for you that can help you do some of these tasks. The free printable is at the bottom of the page! Create any non-perishable table decorations, such as place cards, centerpiece, fold napkins, etc. Plan seating arrangements for all guests, and confirm have enough chairs, plates, glasses, etc. Assign family members to help with guests, including answering door, taking coats, serving drinks, etc. Get your free printable below. 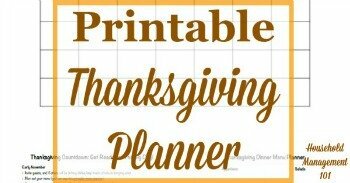 Make sure you put it in your holiday planner!